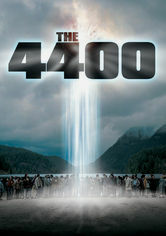 The 4400 (2004-2007) on Netflix USA. Check worldwide Netflix availability! If The 4400 isn't available in your country, or you are visiting a country where it isn't, there is still a way to watch it! 4400 people who vanished over the course of five decades suddenly reappear. None have aged, and slowly it's revealed that they have mysterious powers. A secluded lake. A ball of light. Decades of missing persons reappear in an instant. The real mystery is their future.